Club Atlético River Plate is an Argentine professional sports club based in the Núñez neighborhood of Buenos Aires, and named after the British English name for the city's estuary, Río de la Plata. Although many sports are practiced at the club, River is best known for its professional football team, which has won Argentina's Primera División championship a record of 36 times, being its latest title the 2014 Final. Domestic achievements also include 11 National cups, with the 2017 Supercopa Argentina as the most recent. Those achievements place River Plate as the most winning team of domestic competitions with 47 titles won in the top division. In Second Division, the club has won two titles, in 1908 and 2011–12. At international level, River Plate has won 17 titles, with 11 organised by CONMEBOL and other international bodies. River Plate's achievements include four Copa Libertadores, one Intercontinental Cup, one Supercopa Sudamericana, one Copa Sudamericana, two Recopa Sudamericana, one Copa Interamericana and one Suruga Bank Championship. Furthermore, the club has also won six tournaments organized by AFA and AUF together: five Copa Dr. Ricardo Aldao, and one Tie Cup. In addition, River Plate's reserve team won the U-20 Copa Libertadores in 2012. In a survey published by the Argentine Football Association in 2016, 6 out of 11 players of the all-time Argentine national team had played for River Plate. Previously, in 2000, River Plate had been honored by FIFA as the 9th best club of the century in the world and the best Argentine football club in that ranking. Among other achievements, River Plate is at the top of the list in the All-time Argentine Primera División table, being the Argentine team with most won games, fewest defeated games, most points accumulated, most goals scored, fewest goals against and best goal difference since the first championship held in 1891 and is first in the Historical table of the Copa Libertadores being the South American team with most won games. In 2000, River Plate was named by FIFA as the 9th club of the century and it was the best Argentine football club in that ranking. In 2010, the International Federation of Football History and Statistics placed River Plate in the 9th place in a ranking that included the best teams of the world during the 1990s and 2000s. River was the South American club with the best position in the table. The club was officially founded in 1901 and took its name from the common English name for the Río de la Plata. River has a fierce rivalry with Boca Juniors. Matches between them are known as Superclásico, and the two teams' rivalry is amongst the most heated in the sport, due to their local and global popularity. River's home stadium is Estadio Monumental Antonio Vespucio Liberti, known simply as El Monumental, which is located in the Belgrano district, the largest stadium in the country. River Plate was founded on 25 May 1901, close to the La Boca neighborhood (later the home of fierce rivals Boca Juniors). The institution was formed after the merger of two clubs, "Santa Rosa" and "La Rosales", with Leopoldo Bard being elected as its first president. The name was chosen because of an incident during the construction of Buenos Aires Port: one of the members had seen how the workers of Dique nº 3 left their duties for a while to play a football match. The boxes they were working with just said "The River Plate" (the name the English gave to the Río de la Plata) and that inscription was taken to name the new club. River Plate affiliated to the Argentine Football Association in 1905, debuting in the third division against Facultad de Medicina. On 13 December 1908, the team was promoted to first division after beating Racing Club 2–1. However, the match was declared null due to River supporters jumping onto the field to celebrate with the players, so a new match had to be played. River again won (7–0) to achieve promotion. In 1914 River won its first domestic championship, the Copa de Competencia Jockey Club and its first international title, the Copa de Competencia Chevallier Boutell. The nickname Los Millonarios came after the acquisition of winger Carlos Peucelle in 1931 for $10,000 and Bernabé Ferreyra for $35,000 (Large sum of money for the period) in 1932. In the following years, River Plate consolidated its place as one of the most popular teams of Argentina, and the 20th century brought much success. The clubs record of 28 official tournaments saw them dubbed El Campeón del Siglo (The Champions of the Century). ^ There are different versions about the origin of the red band; some state that it was first worn during a carnival celebration while other say that River Plate adopted the band to distinguish themselves from a team of Villa Devoto that also had white jerseys. 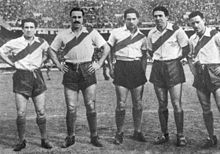 ^ In March 1932, president of the club, Antonio Liberti, reissued the red band jersey, after he came to the changing room and said to players: "Take care of it, boys, because this is the River Plate jersey". Wikimedia Commons has media related to River Plate kits. Adidas has been River Plate's uniform supplier since 1982, becoming one of the company's largest sponsorship deals in the world, only behind German club Bayern Munich. The US$60 million partnership with the German sports company signed in 2015 (extending the deal to 2021) marked the most expensive kit agreement in the history of Argentine football. As in many football shirts and sports in general, the team's jersey has a badge on its front, as a symbol of the institution. When the River Plate jersey was created it did not have a badge, and its presence varied throughout the history, according to the designs of each era. Currently it is embroidered on the jersey, with three colors (red, white and black). Its format resembles that of the jersey, as it has a red stripe that crosses it, along with the acronym of the club (CARP) in black, and the background is white, in a stylized design. When Hugo Santilli became chairman in 1984, he soon called to a competition where a new emblem would be chosen. The main objective of this new image was to eradicate the nickname Gallinas (Chicken) that River's rivals (Boca Juniors fans mainly) used to mock them. Artists from Argentina took part in that competition. The club finally chose a logo designed by the artist Caloi. This emblem showed the figure of a lion (wearing a River jersey) rising from the Monumental stadium. The lion logo was immediately added to the uniforms (on the field and training clothes) having River Plate won the Copa Libertadores de América and European/South American Cup using the lion logo. In 1989, when Santilli left the club so the lion went with him and has not been reestablished since. River fans and the press are fond of the nickname Los Millonarios (The Millionaires). This name derives from the 1930s after some expensive transfers of players from other clubs, including Carlos Peucelle from Sportivo Buenos Aires in 1931 and Bernabé Ferreyra from Tigre in 1932. Due to the red band in their shirt, it is also common to refer to River as El Equipo de la Banda (the team with the band) or simply La Banda (which means "the stripe", but can also mean "the band" -both as in "gang" and "musical group"). Some famous River teams earned nicknames, mostly notable La Máquina (The Machine), nickname given to River Plate's forwards due to their synchronization and movements on the field, between 1941 and 1946. There was also a River Plate team that was known as La Maquinita (The Little Machine, as tribute to its predecessor) in the 1950s. Managed by José María Minella, the team earned the nickname after winning five championships in six years (1952–57). Some notable players were Alfredo Di Stéfano, Santiago Vernazza, Walter Gómez, Enrique Omar Sívori, among others. Some members of the original Máquina of the 1940s such as Labruna and Loustau, were also part of the team. Antonio V. Liberti (Monumental) (1938–present): Built on the same lands where the Bajo Belgrano Horse racing track had existed years ago. Panoramic view of the Monumental Stadium in 2013. River Plate fans welcome the team in a superclásico in 2010. In a research from a European sport marketing agency about the football teams with more members in the world, River Plate is in the sixth position, with 123,000 members, the highest in the Americas. The ranking is led by Barcelona of Spain and Benfica of Portugal. In a ranking made in 2018 by the Bundesliga about the football clubs with more members, River Plate appears in the sixth position with 146,000 members, surpassing clubs like FC Barcelona, Real Madrid CF, Manchester United F.C. and Juventus F.C. among other football world powers. On October 8, 2012, "The world's longest football flag" was unveiled in a caravan in which approximately 15,000 supporters took part. It was made entirely by fans who carried the 7,830 meters flag along the streets of Buenos Aires. The away jersey of the 2012–13 season was the most sold throughout the world during the month of September 2012, an achievement that had not reached any Argentine team. In 2015, the club participated in the FIFA Club World Cup and played against Sanfrecce Hiroshima at the Nagai Stadium in Osaka on December 16, and on December 20 in the final against FC Barcelona at the International Stadium Yokohama. The number of River Plate supporters who traveled to Japan during that period were between 15,000 and 20,000, a record in the competition. River Plate has official subsidiaries in provinces such as Santa Fe, Tucumán, Córdoba, Entre Ríos, Mendoza, Tierra del Fuego, Catamarca, among others, and in Spain, Mexico, Australia, the United States, Paraguay and Canada. There are also unofficial fan clubs in all Latin American countries, and also in Spain, Italy, England, Israel, Australia, Germany, the United States and New Zealand. From its creation in 1901 to the present, the lower divisions of River Plate have protagonized splendid moments in their categories. The River Plate Academy is recognized on a continental and world level for the amount of talents that have emerged throughout it. River produced many of the best players in the history of football, including most of the institution's top idols. Its main objective is to supply players with great future to the first team and educate academically, ethically and athletically its members. Legends of football not only had the privilege of playing in the first division of the club Millonario, but also wore the red and white jersey since the youth categories. The lower divisions of River Plate, also known as "El Semillero" has always been the most fruitful of Argentina, the most important and also the one with the greatest success. Historically it is considered as the best soccer training school of the Americas and one of the best in the world. Two players who won the Ballon d'Or, Alfredo Di Stéfano and Omar Sívori, were born from "El Semillero". Adolfo Pedernera was the natural conductor of La Máquina. José Manuel Moreno is considered one of the best South American players ever. Alfredo Di Stéfano is regarded as one of the best footballers of all time. Omar Sívori started his career at River Plate before moving to Italy. Oscar Mas is the all-time 2nd. top scorer. Daniel Onega holds the record for the most goals scored in a single season of Copa Libertadores. Reinaldo Merlo played his entire career in River Plate. Daniel Passarella was player, manager and president of River Plate. Norberto Alonso, one of the most iconic players of River Plate. Ramón Díaz and Marcelo Gallardo are the most successful managers of all-time, with nine titles each. Gallardo (appointed in 2014) is the current manager and under his direction, River Plate has won its most international championships. Domestic titles won include two Copa Argentina (2015–16, 2016–17) and one Supercopa Argentina (2017). He has been specially successful in the international scene, having won two Copa Libertadores (2015, 2018), one Copa Sudamericana (2014), two Recopa Sudamericana (2015, 2016), and one Suruga Bank Championship (2015). Several of these championship wins included memorable victories against archrivals Boca Juniors. Ramón Díaz had three tenures on River Plate (1995–2000, 2001–02, and 2012–14), being the club's most successful manager in the domestic scene, having achieved six Primera División titles (1996–97 Torneo Apertura, 1996–97 Torneo Clausura, 1997–98 Torneo Apertura, 1999–2000 Torneo Apertura, 2001–02 Torneo Clausura, 2013–14 Torneo Final) and one Copa Campeonato (2014); internationally, he won the Copa Libertadores (1996) and one Supercopa Libertadores (1997). José María Minella was another notable manager with eight titles won with River Plate, seven Primera División championships (1945, 1947, 1952, 1953, 1955, 1956, 1957) and one Copa Dr. Ricardo Aldao (1947). Ángel Labruna had an outstanding career not only as player (he is club's all-time topscorer with 293 goals in 515 matches played), but as coach for the club, having won six Primera División championships (1975 Torneo Metropolitano, 1975 Torneo Nacional, 1977 Torneo Metropolitano, 1979 Torneo Nacional, 1979 Torneo Metropolitano, and 1980 Torneo Metropolitano). Héctor Veira won the Copa Libertadores de América with River Plate, in 1986. That same year the team won the European/South American Cup played in Tokyo. Under his coaching the club also won the 1985–86 Argentine championship, totalizing three titles with River Plate. The basketball team currently plays in the Torneo Federal de Básquetbol. In 1950, the first FIBA World Championship was played in Buenos Aires and Argentina claimed the gold medal with 3 River Plate players: Alberto López, Leopoldo Contarbio and Vito Liva. The club won a Campeonato Argentino title in 1983, and finished in the 2nd place in the Campeonato Sudamericano de Clubes Campeones de Básquetbol in 1984. The last edition of the Campeonato Argentino was held in that year, and River Plate was defeated in the finals, then playing at its successor competition, Liga Nacional de Básquetbol, between 1985–93 and 2004–06. The team reached the finals in 1988, and for the 1989 and 1990 seasons, Héctor Campana became the top scorer of the LNB, playing for River Plate. The team also achieved 2nd place in 2004 and 2005 editions of Copa Argentina. Since 2014, after eight years of absence in profesional basketball, River Plate returned to national tournaments playing the CABB Federal Basketball Tournament. In 2016, the squad (nicknamed Las Vikingas) won its first Metropolitano championship after beating Ciudad de Buenos Aires by 3-2 at the final. In 2017, Las Vikingas won their third consecutive Hockey National League after defeating Club Italiano by 2-0 at the final, thus becoming one of the two clubs with most titles at the national tournament. Two players from River Plate, Lucina von der Heyde and Bianca Donati, who were Junior World Champions in Chile 2016, made their debut in a world cup in London 2018. Von der Heyde was named the FIH Rising Star of the Year. The futsal team plays in the Argentine División de Honor. The team won 3 championships in 1991, 2002 and 2003, and 2 Copa Argentina de Futsal in 2016 and 2017. The team also achieved a 3rd place in the Copa Libertadores de Futsal in 2013. River is one of the founding clubs of the Federación Metropolitana de Balonmano (Fe.Me.Bal.) and it is also the institution that won more championships in local history. All these titles have been obtained in the metropolitan and national levels, either in Metropolitan, Aperturas, Clausuras, Super 4 or Nacionales Tournaments, or the Federal League. The men's team won 32 domestic titles and the Gold medal in the South American Men's Club Handball Championship in 1984. The team also achieved 2 Bronze medals in the same competition and 4 Bronze medals in the Pan American Men's Club Handball Championship. The women's team won 9 national titles, and the Silver medal in the South American Women's Club Handball Championship in 1984 and the Bronze medal in 1987. The more prominent players in the club's history are Guillermo Till, Claudio Straffe, Freddy Ambrosini, Gabriel Canzoniero and Juan Ojea. The current swimming team has its origins in 2003, after many years in which the Club Atlético River Plate had no representatives in the national championships of this discipline. The draft to form the best team in the country was led by Professor Rodolfo Sacco and had the best results that had never been achieved in the institution. The team began to form from a contractual relationship with the swimmer José Meolans, one of the Argentine swimmers with most titles won. Many high-level swimmers, trained in other institutions began to approach to be part of what would be the best team in the country for the coming years. Other swimmers from River Plate who represented Argentina in the Olympics include Meolans himself, Georgina Bardach, Eduardo Germán Otero, Walter Arciprete, Agustín Fiorilli, María del Pilar Pereyra, Juan Pereyra, Damián Blaum, Javiera Salcedo, Pablo Martín Abal, Cecilia Biagioli. Tennis is a sport practiced in River Plate since 1923. Currently, River Plate counts with 10 clay courts and one hard court. As in other disciplines, the Club stands out for its large number of teams participating in the official tournaments organized by the Asociación Argentina de Tenis, as well as having important activities and competitions for the development of this sport in the country. Gabriela Sabatini, who is considered the best Argentine women's tennis player in history and an icon in national women's sport, began practicing at River at age 6, under the direction of Professor Daniel Fidalgo, with whom she trained for seven years. When she was 12 years old, she participated in the Mundialito Infantil de Caracas, winning the competition, and ratifying once again the talent she had already shown during his participation in metropolitan and national children's tournaments. River Plate Women's division reached the national title four times, being one of the top champions of the league and the first to be champion three consecutive times (2005 to 2007). The men's volleyball team won the Liga Argentina de Voleibol in the 1998–99 season with the Brazilians Jefferson, Marcos Dreyer, and the nationals Marcelo Román, Diego Gutiérrez and Luis Gálvez  and the Súper 4 in 2003. The team also won 8 Metropolitan Leagues between 1956 and 2011. The River Plate Women's football team plays in the Campeonato de Fútbol Femenino and have won the championship 11 times of which 5 were in succession from 1993 to 1997. The team achieved the 3rd place in the 2017 Copa Libertadores Femenina. In addition to the mentioned sports, River Plate's sections include artistic gymnastics, artistic roller skating, athletics, basque pelota, boxing, bowls, chess, karate, rhythmic gymnastics, roller hockey, taekwondo, table tennis and waterpolo. ^ Grady, Daniel (2014). Mario Yepes. Mason Crest. p. 15. ISBN 978-1-4222-9154-2. ^ Restrepo, Andres (5 August 2015). "River Plate: ¿por qué 'Gallinas'?" [River Plate: Why 'Hens'?]. VICE Sports (in Spanish). Retrieved 25 January 2018. ^ a b c "River Plate, ensancha sus vitrinas para seguir sumando copas | Conmebol.com". www.conmebol.com. Retrieved 16 August 2015. ^ "Argentina's River Plate continues to add trophies". CONMEBOL. 16 August 2015. Retrieved 20 August 2015. ^ "Goleamos". www.goleamos.com. Retrieved 26 August 2016. ^ "La Selección de todos los tiempos". www.afa.org.ar. Retrieved 7 February 2016. ^ a b "FIFA Club of the Century". RSSSF. Archived from the original on 12 January 2016. Retrieved 23 March 2015. ^ Aldo Colombo and Ricardo Pontes (29 February 2012). "Copa Libertadores - All-Time Table (1960-2011)". RSSSF. Retrieved 9 December 2018. ^ a b Rocca, Santiago (12 August 2015). "Los títulos internacionales logrados por Gallardo como técnico de River" (in Spanish). TG News. Archived from the original on 18 November 2015. Retrieved 13 August 2015. ^ "El fenómeno River". Retrieved 13 August 2015. ^ "Copa Libertadores 2015: River Plate triumph — CNN.com". CNN. Retrieved 7 August 2015. ^ Plate, Club Atletico River. "e-Sports". caRiverPlate.com.ar (in Spanish). Retrieved 27 July 2018. ^ "El campeón del siglo" [The champions of the century]. La Nación (in Spanish). 29 December 1999. ^ "Bayern Múnich, el club más grande del mundo: más socios que Barcelona, River Plate, BVB y Schalke". bundesliga.com/es (in Spanish). Retrieved 22 March 2019. ^ "River es el sexto equipo con más socios en el mundo". www.foxsports.com.ar (in Spanish). Retrieved 22 March 2019. ^ "River Plate squad". Soccerway. 20 August 2017. Retrieved 20 August 2017. ^ "The River Plate Academy way". thesefootballtimes.co. Retrieved 13 February 2019. ^ "El recuerdo retro de Cavenaghi". ole.com.ar. Retrieved 13 February 2019. ^ "The clubs that have produced the most players currently active in Europe's Top 5 Leagues". 90min.com. Retrieved 13 February 2019. ^ "La Masia and Other Top 10 Youth Academies in the World". Bleacher Report. Retrieved 13 February 2019. ^ "This XI of River Plate academy products to play in Europe since 2000 is outrageous". givemesport.com. Retrieved 13 February 2019. ^ "IFFHS History: South America - Player of the Century (1900-1999)". iffhs.de. Retrieved 13 February 2019. ^ The "Superfinal" is considered as a national cup by the Argentine Football Association. ^ a b Cantaro, Eduardo (11 December 2014). "La docena millonaria". Telam. Retrieved 26 April 2015. ^ Unofficial trophy contested between Copa Sudamericana and UEFA Europa League winners. ^ "Básquet". cariverplate.com.ar. Retrieved 14 February 2019. ^ "River Three-Times National Champion". cariverplate.com.ar. Retrieved 14 February 2019. ^ "De Goede & Van Doren named Players of the Year in 2018 FIH Hockey Stars Awards". fih.ch. Retrieved 14 February 2019. ^ "River se consagró bicampeón de la Copa Argentina de futsal". lanacion.com.ar. Retrieved 14 February 2019. ^ "Podio histórico". ole.com.ar. Retrieved 14 February 2019. ^ "Handball". cariverplate.com.ar. Retrieved 14 February 2019. ^ "Men's Clubs Senior Panamerican Competitions". panamhandball.org. Retrieved 14 February 2019. ^ "Women's Clubs Senior Pan American Competitions" (PDF). panamhandball.org. Retrieved 14 February 2019. ^ "Natación". cariverplate.com.ar. Retrieved 14 February 2019. ^ "Tenis". cariverplate.com.ar. Retrieved 14 February 2019. ^ "Sabatini, la mejor de todos los tiempos". ellitoral.com. Retrieved 14 February 2019. ^ "Bolívar, una máquina que no se detiene". lanacion.com.ar. Retrieved 14 February 2019. ^ "Se cumplen 18 años de la Liga Argentina que ganó River Plate". voleyplus.com. Retrieved 14 February 2019. ^ "River Plate – Somos Vóley". somosvoley.com. Retrieved 14 February 2019.